We need YOUR help to solve a lizard mystery! 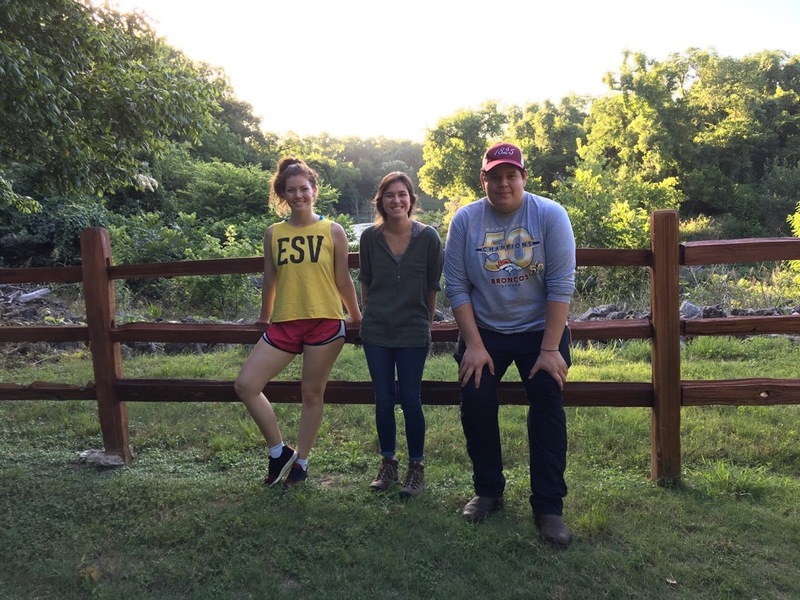 For the past eight years, members of our Lizard Lab have studied green anole lizards (scientific name: Anolis carolinensis) in Palmetto State Park in Luling, Texas. This park is about an hour east of San Antonio (where we live), and it’s a beautiful place. 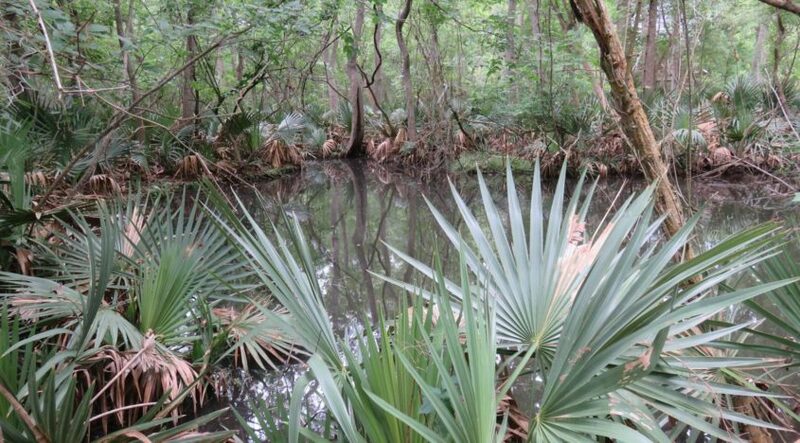 The park is named for the many dwarf palmetto plants in the swampy center of the park, and the San Marcos River flows through the park too. In our work in the park, we’ve watched lizard behavior, mapped where they live, measured their body size, and counted the parasites that live on them. We calculated that the density of green anoles in the park (or, how many lizards live in a small space) is approximately 0.04 lizards/m2. This is the same as four adult lizards in every 10m x 10m area, or one lizard in a space about as big as two rooms of your house. While we’ve studied these lizards a lot, we don’t catch the lizards and take them out of the park – we leave them where we find them! So what happened to the anoles? We don’t know, but we’ve been thinking about it and talking with other scientists who study lizards, and with the staff who work in the park every day. The first thing we thought of was that maybe there were cats in the park – cats kill lizards, and can wipe out a whole lizard population quickly, but we haven’t seen any cats in the park. What if the insects that the lizards eat have all died? If that happened, the other lizards, snakes, and frogs would die too, not just the green anoles we’re looking for. Weather can also affect lizards, but this isn’t a very wet or dry year, and it didn’t get too cold last winter for the lizards. And, the plants in the park look the same as they have before. The best ideas we’ve come up with, are that maybe a disease that only affects anoles has spread through this population, but that seems very unlikely. Or, maybe some other people caught all the lizards they could find in the park, to sell them. This is against the law, because you’re not allowed to take animals or plants out of a state park without permission. Do you have any other ideas to explain this, lizardsandfriends readers? The Lizard Lab team at Palmetto State Park, May 2017. Note: another version of this post was originally posted on anoleannals.org on July 6, 2017. Maybe the brown anoles have ‘moved’ in. Here in Central Florida we too have noticed a decline in green anoles – until recently. Last summer we saw our first in years, and now have seen 3 different green anoles st our front and back doors. The brown anoles from the Greater Antilles introduced to the U.S. have ‘forced’ the green anoles up into the trees. There’s great information at the Broad Institute and a green anole genome project. Great article! I have a screened in porch with plants and drift wood. The anoles were my friends. Many inside none out. Suddenly, they are all gone. Now there are gnats…no dead guys. Clermont FL. I live in southeast Texas in Brazoria County. It’s about 30 mins from the coast. In previous years there were so many green lizards on our screened in front porch. They would hang out there all summer long enjoying the sun. I haven’t seen a single one this year. Not one. Instead we are being overrun by insects. The insects in our area have doubled compared to previous years. It’s crazy! I have been wondering the same thing. I live in Montgomery County, Texas. Last year, as in previous years, our house, yard and trees were teaming with our friends, the green anoles. This year, we have only one. Now I am obsessed with finding them, looking for them everywhere I go. The buildings near mature plants and trees that I would consider excellent green anole habitat are barren. I found a juvenile at a local nursery; that’s it. We do not have the brown anole in our area (yet), so I can’t blame them for the disappearance. We did not have a particularly harsh winter, other than a hard freeze one day. It is baffling. When you figure it out, please let me know. Thanks, Anne. I’m hearing more and more similar reports from across southeastern Texas. I’m still not sure how to explain it, but collecting information like this is an important start. We live in an old neighborhood in Houston. We have noticed that the Cuban lizards have come in the past few years. They are very big and aggressive even against us, teasing and taunting us as we sit on our porch swing. Recently, I was looking out the front window and there was a hawk hopping around among the front bushes where the lizards like to play (we still have some green ones). I imagine lizards make a good snack for birds and the green ones are easier to see. I have noticed an increase in the hawk population in the suburbs. Maybe they are causing this lizard decline as well. Thanks for your comment, Lucy! Anoles are indeed a great snack for birds of prey like the hawk you observed. I don’t know of any studies comparing bird predation on green and brown anoles, but that’s a really interesting idea. I’ve been avocationally surveying the brown anole population in Montgomery County last year and this year; amazingly though I’m sure they’ve been here for a long while, they weren’t recognized in the county by the scientific community until I submitted a voucher specimen last fall. I have photos of browns and greens within 10 feet of each other, though this year I have seen much fewer greens as others have mentioned. Locally, at least, we haven’t received as much rainfall this year and I think that’s contributory to fewer greens being visible (though they are reproducing). Browns aren’t in my neighborhood (yet), though they are about 3/4 mile from here. Interestingly, in some neighborhoods, one yard will be teeming with browns, but not their next door neighbors’. I plan on conducting an online survey of our city’s residents to gather information on pesticide use, neighborhood cats, most recent tropical plant purchases, etc. to help get a handle on this–would be interesting if we could get a grad student down here to run some genetic analysis to determine whether the spotty distribution is caused by discrete populations due to separate introductions or if they’re homogeneous. Hi Chris, Thanks so much for your work to document the distribution of green and brown anoles in your area! I know this is hard work that takes consistent effort, and it would be wonderful to have a grad student begin working on genetic analyses or related questions. (Unfortunately, I don’t work with grad students, as we only have undergraduates at Trinity.) Please feel free to email me directly (mjohnso9@trinity.edu) if I can help support your work with these lizards. Was looking around the web for any commentary on the dearth of green anoles the past month or so and found this blog. They were relatively abundant throughout the spring, and even last winter here in my Baton Rouge yard, but I have not seen even one in over a week. I have a few rows of field peas in the garden and usually it is teaming with them – especially hatchlings, like a mini Jurassic Park, as I walk thru harvesting the pods. Not this year, not even the brown invaders. I need them to keep the bugs down, especially the tropical sod web worm which has become a real nuisance in the lawn and garden. There are quite a few new cats in the neighborhood, but I don’t see them in my yard very often and I doubt they would bother to negotiate the tangles of my pea patch for such a tiny snack. It’s too soon to conclude anything, but just wanted to add this observation. Thanks for this, Randy – collecting information such as this is an important step in teasing apart what’s going on with these lizards. I have not seen one green anole in Baton Rouge this spring or summer. I did see a couple in my mobilehome over the winter. Have not seen the brown anoles yet in Baton Rouge. The ribbon snake population seems good this year. Thanks for the report, Brett! It’s good to hear there are abundant ribbon snakes, at least. Here in Houston there are plenty of the newer brown lizards in my garden. They’re faster, more aggressive than the green ones and don’t mind running around on the ground and in the plants. I think the green ones are being out hustled for territory and food. Hardly ever see a green lizard nowadays. I have started seeing a few green anoles. Saw a couple in town, then one near my front gate. They all looked like small females. They are coming back. I think the flood last year may have drowned eggs. Here in Wilmington, NC, I saw lots of green lizards early to mid spring (through mid May) but since I’ve been back in town — mid August — not one. Any updates on what’s going on? Why the little things are disappearing? Hi Les, Those are probably green anole lizards, and you see them so commonly in the spring and early summer because that’s their breeding season, and they’re out displaying to each other often. The fall and winter are the nonbreeding season, and these lizards are much less active, so you see them more rarely. Hi Paul, You might be seeing curly tail lizards? They’re bigger than anoles, and usually on the ground, and are relatively new invasive arrivals in Florida. Or possibly agamas, which are also invasive, or even Anolis equestris (the large knight anole)? Or perhaps you’re seeing skinks, which are not invasive but generally live under leaf litter and are harder to find. Florida does have a large number of new lizard species, as people are moving animals around the planet so quickly. 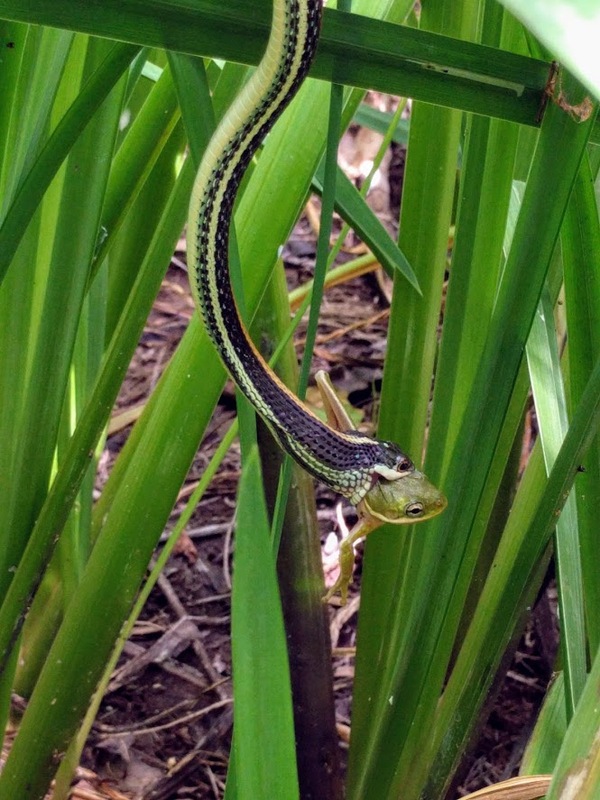 if snakes are eating the frogs, I’m guessing that they are also preying on lizards. those green anoles are just the right size for a smaller snake to snack on. I work at a marine lab in Cedar Key, FL, just south of the Suwannee River. I see brown and green anoles here. I have seen egrets hunting for those lizards. do you folks have herons? 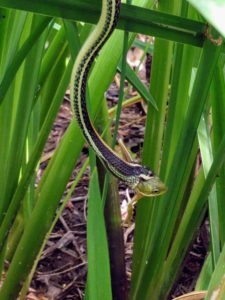 Wilmington,NC: Many people here have noticed, since February, no green anoles have been seen in areas that have had previously high populations. We continued to see them and last saw them in February, on average the coldest month for us. Our cold weather lasted longer than usual this year. Temperatures were below average through April. We noticed a lot of palm trees died this year. However, there are a plethora of tree frogs and other critters back. This is the first time in ten years I have witnessed this disappearance, not just a decline. Others agree. We are concerned here. We would like to help the Green Anoles of Carolina make a comeback. We also live in Wilmington and are very concerned about the complete disappearance of the green anoles. Any information would be appreciated, and we would like to help them to come back if there is anything we can do! Noticed the same thing here in Marion County, SC. has also declined. Sad so much pesticides are being used. I am outside Chadbourn NC, about an hour west of Wilmington, NC. We have also experienced a total disappearance of green anoles, where previously we have always enjoyed a huge population. I am also concerned. Wow. I have been asking this question for a couple of years. I live in Austin and have a large deck with lots of plants in large and small pots. Also i have large flower beds. I had a large population of Green Anoles. I also had/have a few Texas Spiny lizards and Six Lined Racerunner lizards also. Every time you were on the deck, if you where looking, you could see at least 2-3 green anoles of deferent ages. in the fall of 2016 they seemed to disappear. The Texas Spinys and the Six lined racerunners where fine. I made sure it wasn’t any pest prevention my guy was using also. It wasn’t a harsh winter because it seemed to happen before. I didn’t notice any other increase of any reptiles or other predators either. It weasand still is a mystery. Since then i have seen maybe 3-4 total, at different times.